If your showerhead is leaking, there is a high probability that the holes in the showerhead are clogged. Over time, mineral deposits build in the showerhead and block passages. When the passages are blocked, water will leak out of weak spaces in the handle and pipe of the showerhead. In order to fix this, you will need to clean out the showerhead with vinegar to lessen the deposits. Another common cause of a leaky showerhead is a faulty faucet. Most showers have compression faucets that separate the cold water from the hot water. If the seal behind these faucets fail, it will cause the showerhead to leak water. In order to fix this problem, the defective washer seal must be replaced. It is important to repair a leaky faucet. Not only is it a consistent waste of water, but the incessant dripping will also lead to a large waste of money. 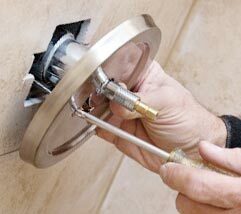 If you do not feel comfortable fixing the shower on your own, contact a plumber in NYC for further professional assistance.